NEW SOLD SECURE "GOLD" APPROVED PRODUCT. Single 8mm heavy laser cut hardened Bridge. Fully case hardened to RC60 spec. Very large aperture of 100mm x 50mm making this the ideal anchor for 16mm+ larger chains. Fits two of our 16mm chain through together. Base plate 150mm x 150mm. Solid construction. Powder coated finish. 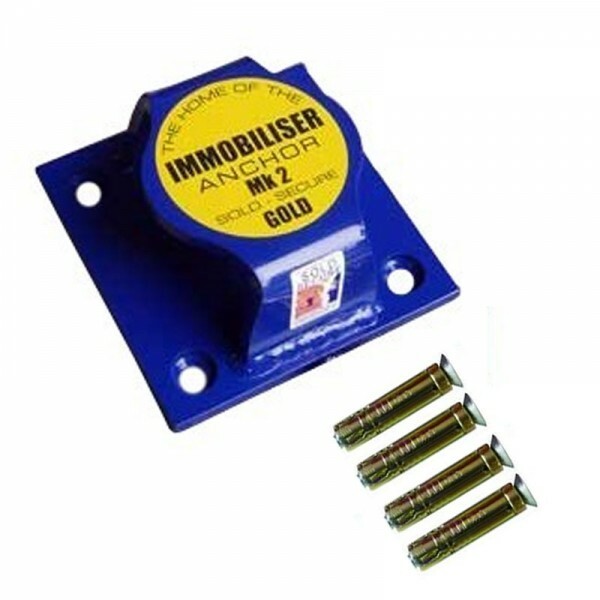 Supplied complete with four security fixing bolts, steel ball inserts and fitting instructions. Ideal uses include securing Motorcycles, Scooters, High value bicycles, Quad, ATV's, plant, machinery, ride on lawnmowers, caravans, trailers etc. Made in Britain by PJB.